Though November is now upon us, the warm Key West air is here to stay and has provided amazing fishing conditions this past week. There were plenty of amazing catches this week on each one of our many fishing charters, bolstered by the relatively sunny weather throughout. Though it was difficult to choose which catch would earn our award, the answer became quite clear in short with an amazing catch of two Yellowtail Snappers that weighed in at around 20 pounds apiece. 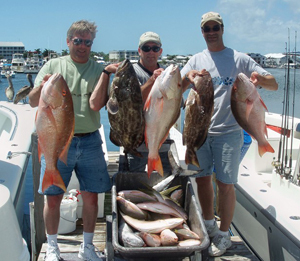 These delightful Snappers were caught by Pierce and John, two visitors traveling to Key West for a bit of fishing. While Yellowtail Snapper are typically among the most common species of fish in and around Key West, they are still highly sought after as a game fish due to the brilliant yellow and silver hues that adorn their bodies. In fact, it is for this reason that they are also sought after as a means to be displayed within large aquariums. 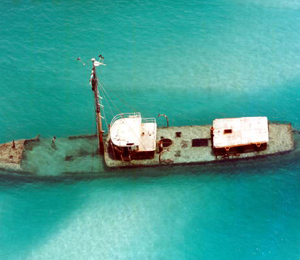 They make their habitats around coral reefs, the perfect spots to go to when attempting to catch them. The reason they are named as such is due to their yellow tails, as well as the bright yellow line that extends from the head down to the tail. 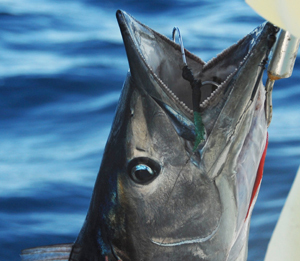 This makes it easy for anglers to spot them during Key West light tackle fishing. Though Yellowtail Snappers thrive primarily during the summer months, they can still be found in abundance throughout the year, especially as the weather is still in the low to mid 80's here in Key West. Yellowtail Snapper are one of the smaller species of fish, weighing an average of 5-10 pounds, which makes the large weight of 20 pounds each for the two caught by Pierce and John even more astonishing than usual. 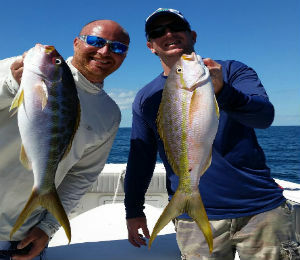 Yellowtail Snappers commonly feed on smaller fish, shrimp, worms and even crabs, which is why Key West light tackle fishing is the perfect type of fishing if you are specifically looking to catch a Yellowtail Snapper, or six if you want to match the feat Pierce and John were able to pull off. Yellowtail Snapper will also be scared off by larger hooks and thicker line, making the decision to go with light tackle even easier. If you are planning to come by Key West to take one of our many light tackle charters out onto the open waters in search of some Yellowtail Snapper to catch, the best time to do so would be right after it's been raining, as this species will often feed during that time. However, as Yellowtail Snapper are so common, it's never too difficult to catch them, no matter the weather or time of day, which also makes the Yellowtail Snapper the perfect species of fish to target if you are an inexperienced angler. Who knows, you might even find that you reel in an even more impressive catch than Pierce and John, placing you as one of our Key West Catch of the Week winners.